Who is a true Guru? Is he the one that teaches worldly education? Is he one that that explores properties of matter? No, they are only teachers. Is one who teaches a manthra or Vedanata a Guru? No, we may call them Acharyas, not Gurus. People consider a person who imparts knowledge as a preceptor. But most of them are mere teachers, not preceptors (Gurus). A teacher who teaches others has had a teacher himself. The one who has no Guru above him is the true Guru. The true meaning of Guru is "one who dispels darkness of ignorance". "Gu" means "darkness of ignorance" and "Ru" means "one who removes". Another meaning for Guru is "One who reveals the Guri (target) to the disciple". He does this by removing the darkness of ignorance. Guri here refers to the Atmic principle present in every human being. The real Guru who can reveal the Atmic principle is a Jnaanamurthy (embodiment of wisdom); He is the very embodiment of Divine principles; and He is one who takes upon Himself a form to teach the same to the disciple; he is God Himself. Another meaning of the word Guru is "one who is beyond attributes and forms". Gu stands for Gunaatheetha - one who transcends the three Gunas (Satva, Rajas and Thamas); Ru stands for Rupavarjitha - one who is formless. The One who is beyond all attributes and forms is none other than the Supreme Self (the Brahmam) who is resident within each of us. Only God can be regarded as One who is beyond attributes and forms. Guru is Brahma, who is the Creator of the universe. Guru is Vishnu who is all pervasive and is also the Doer in the universe. Guru is Maheshvara who commands and ordains everything in the universe in the right manner. Guru is not one who merely teaches. 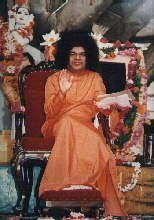 A real Guru is Omnipotent, Omniscient and Omnipresent, He is God Himself. There is only one Guru, that is God and there is no other Guru. We have to recognize Him as our only preceptor. He is the preceptor of preceptors. Realizing that God dwells within us, we must treat God as the universal Guru and the preceptor for mankind and contemplate on Him. Let us purify our hearts to let the Divine dwell in it. Let us install God, our Sadguru, in our hearts. The vibrations that emanate from from the heart will elevate us and confer Divine Wisdom on us.